The Icelandic Met Office are reporting that seismic activity at Barðarbunga is currently elevated and is indicative of magma movement beneath the surface. While there are no signs of an eruption occurring at present (21/08/2014), we are keeping an eye on the situation in case of escalation. The volcano has a history of eruptions producing lava flows as well as widespread ash and pumice. A VEI 6 eruption is documented from 1477 demonstrating that this volcano has the potential to cause widespread disruption. Some roads in the region have been closed and in the morning of the 18th August the aviation colour code for the volcano was elevated to Orange (the second highest) by the IMO who continue to monitor the situation closely. Many airlines are taking this opportunity to test procedures and run practice exercises; Nicarnica Aviation are acting in an advisory role regarding the ongoing activity to a number of them. For the most recent information, see the IMO Website News. One of our NicAIR II instrments has been out in the field monitoring the ongoing fissure eruption at Holuhraun. Along with recording images of spectacular fire fountains and a sizable SO2 and water plume, we noticed something slightly unusual around 6 pm on Wednesday 3rd. The “Volcano Tornado” can be seen in the video below – it is most likely that the generation mechanism is similar to that of dust devils which are commonly seen alongside volcanic eruptions, but in this case contains SO2 and other hot volcanic gases and ash particles. Over the weekend a new fissure eruption began at Holuhraun, a lava field north of Barðarbunga. Once again, this is not beneath the glacier and there is no ash being produced. The new fissure is estimated to be 1.5 km long and is producing lava flows and a large, white steam plume. The activity is visible from satellites as shown by this MODIS image where the new eruption site is indicated by the red ellipse and the steam plume is just visible through the cloud. Last night a 1km (0.6 miles) long fissure eruption started in a lava field north of the Vatnajokull glacier. The aviation color code was raised to red, but has recently been reverted back to orange as the eruption shows no sign of producing an ash cloud. Almanvarnir report that a small no fly zone exists over the volcano, but that all airports in Iceland are open. The area immediately surrounding the volcano is closed for safety reasons. While there is minimal impact on aviation at present, we will continue to monitor the situation for changes in activity. There is still no sign of magma breaching the surface at Barðarbunga, although the increased seismicity is continuing. During the night over 500 earthquakes occurred in the region, including some of magnitudes over 5. The data indicate that a dyke is propagating northwards from Barðarbunga towards the Askja fissure swarm, which is part of the Askja volcanic center. Geologists believe that there is molten rock beneath Askja and if the Barðarbunga meets this system, an eruption could be triggered. At present the outcome of this situation is unclear, but IMO and other scientists continue to monitor the situation closely. The IMO have announced that the aviation color code will be moved from red back down to orange. 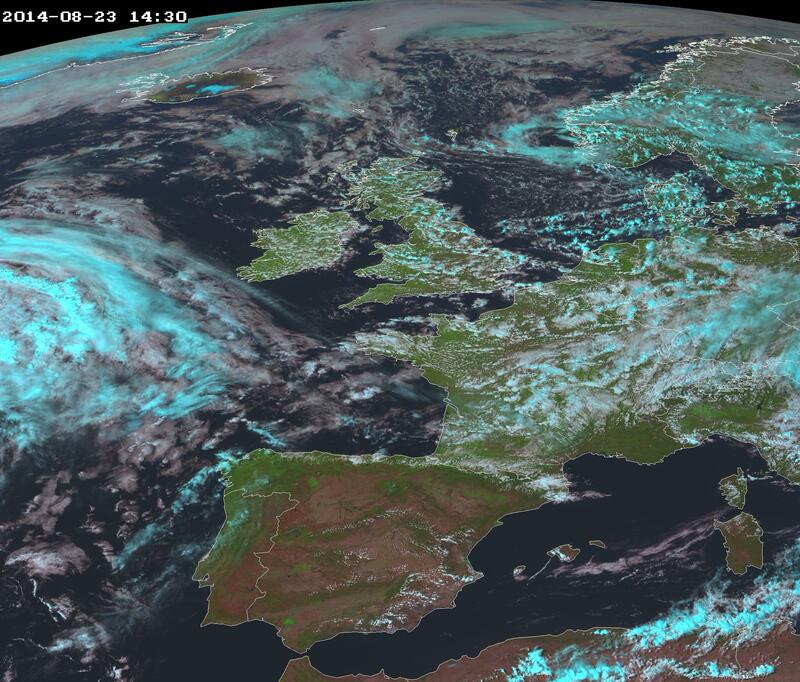 Observations show that a sub-glacial eruption did not occur yesterday. The intense low-frequency seismic signal observed yesterday must be from a different cause. The do however stress that there are no indications that the activity is slowing down, and therefore an eruption can not be excluded. Seismic activity at Barðarbunga is still high – some M > 5 earthquakes have been measured overnight. There is still no confirmation of eruption; IMO and scientists around the world continue to monitor the situation carefully. Nicarnica’s Dr Helen Thomas gave an interview to the Associated Press on Wednesday this week about the situation at Barðarbunga. Click here to see some of the interview footage. Images from the MSG SEVIRI satellite will be instrumental in monitoring Barðarbunga if the eruption breaches the glacier and forms an ash cloud. Below are some of the most recent data acquired from SEVIRI, currently showing no ash cloud. IMO have confirmed that an eruption has started at Barðarbunga. At present, data from radar and webcams indicate no change at the surface – the lava is below the 150-400 m of ice. The aviation color code for the Bárðarbunga volcano has been changed from orange to red: “Eruption is imminent or in progress – significant emission of ash into atmosphere likely”. 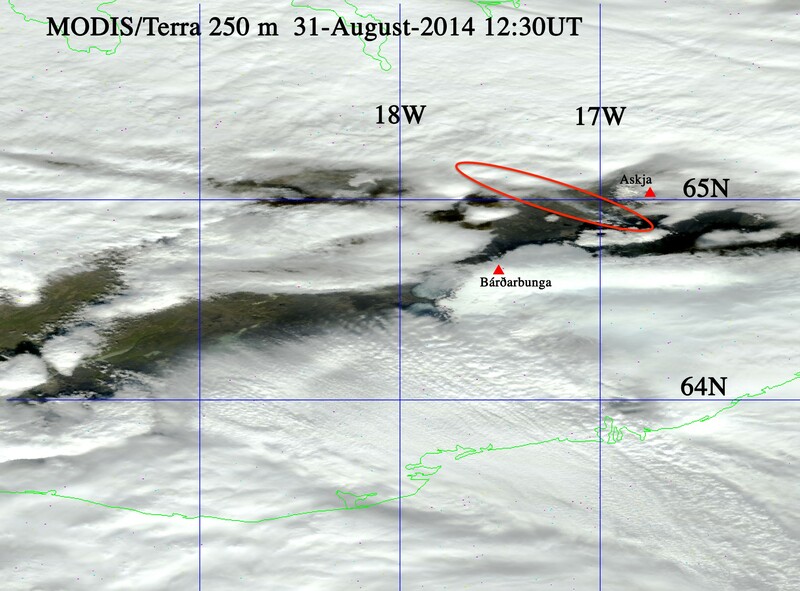 Update 21/08/2014 17:05 UTC The latest image from the MODIS/Aqua satellite instrument shows no signs of eruption at Barðarbunga today. Nicarnica Aviation continues to monitor satellite data to assist the aviation industry in case of an eruption from Iceland. 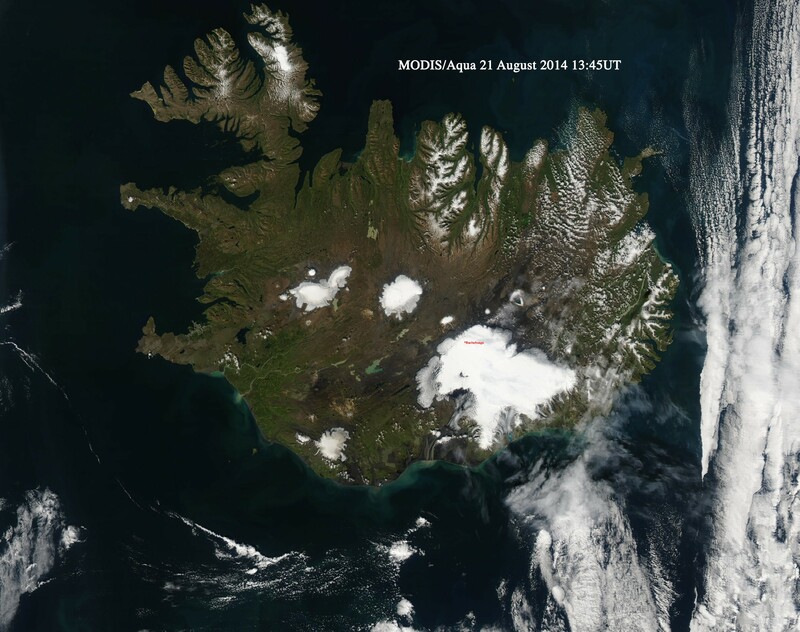 MODIS / Aqua Image of Iceland on 21st August 2014, acquired at 13:45 UTC.